You are here: Home / Health / Your Dog, your health booster! Your Dog, your health booster! He is your baby you can’t live without. He is your friend who walks beside you in the moments of happiness and pain. He is your companion in all the fun activities you enjoy doing. But did you know that he is also a route to your healthier self ? 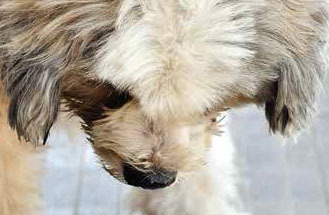 We all dote on our dogs and count on them for making our lives more fulfilled and delightful. But did you know that spending time with your pooch could be much more than just a feel-good factor? Your pooch can be your health booster and at times your life saver. Here are some of the ways your wagging buddy can keep your doctor away (scientifically and not just literally with his constant woofs). have conducted various studies to understand the benefits of pet parenting a dog. National Institute of Health (NIH) conducted a study on 421 adults who suffered from heart attacks. After studying these men for about a year, it was found that the men who are pet parents to dogs were more likely to be alive when compared to those who live without pets. This could be attributed to the ability of pets to reduce cardiac problems, by bringing about a feeling of happiness and optimism among their pet parents. Get the benefits of partnership: Tremendous benefits can be gained through partnership or companionship between dogs and their pet parents. Walking, then running, every morning is helpful in recovering from knee injuries. Living with dogs help people reduce level of blood pressure and other related ailments. 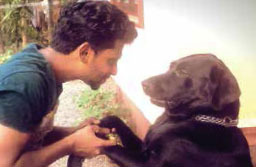 Grieving is not always easy for humans, but doggies help to reduce it. Most of all, bringing a pup home always lends soothing effect to children. Your hound can reduce hypertension: A study conducted at the State University of New York in Buffalo found that pet parents, when compared to non-pet parents, experienced lower blood pressure under stressful situations. Dogs lower the level of stress hormones named cortisol released by our body in response to stress. They also increase the level of brain chemicals, serotonin and dopamine which create a feeling of well-being. Fido can keep you fit: You hate to get up in the morning and go for a walk. But your pooch is hyper-excited about his morning walks. So when he drags you off your bed in the morning or wakes you up with his good morning licks, you can’t help but take him out for a stroll. Studies have shown that a daily dose of moderate exercise can stave off various health problems like obesity, cardiovascular diseases, blood-pressure, osteoporosis, etc. Walking your dog for just 30-45 minutes every day will provide you with the amount of exercise needed to stay fit. 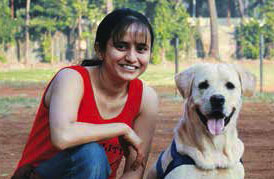 Jogging with your doggy and playing Frisbee with Fido can be some great ways to stay fit and have fun together. Your pooch can thus cause you to enjoy exercising by making it a lot more fun. Fido can help fight depression: Pet therapy is often prescribed by psychologists and therapists to those dealing with depression. The unconditional love showered by dogs has a therapeutic property. It can make us feel important and taking care of a pet can divert our focus away from our problems. We all have a strong need to be listened when we are feeling low and dogs being such great listeners fulfill that need perfectly. Your pooch will intently listen to all that you have to say without judging or criticising you. Petting your pooch and cuddling up with your canine can be amazing stress-busters. Your mutt can make you happy: Happiness is infectious. No matter what problems they are facing, dogs are always in a happy and fun-loving mode. You might come home in a bad mood after a stressful day at work but the sight of your pooch happily wagging his tail and welcoming you with loving licks, makes you forget your worries and feel more happy and positive about life. Feeling lonely? Own a doggy: Pets have always been popular among those living alone, away from their family and friends. Apart from the need for security, these people also keep pets for companionship. Humans can develop strong emotional bonds with dogs and this strong friendship between pet parents and their dogs can make them feel loved and ward off loneliness to a large extent. Studies have shown that those with an active social life live longer and stay physically and mentally agile when compared to those leading a reclusive life. Pets encourage us to reach out and mingle with others. When your dog starts playing with his newly found barking buddy in the park, you can’t help but strike a conversation with his buddy’s pet parent who also shares your passion for dogs. Compassionate canines for kids: Pet therapy is being used to treat kids with behavioural problems. In a study conducted on preschool kids at Oregon State University, it was found that spending time with canines enhanced the social skills of children and boosted their self-esteem. Pet therapy has been found to improve the cognitive and communication skills of autistic kids.When it comes to our health, happiness and well-being, pets have a huge role to play. Make sure you take good care of your pooch and keep him happy. So, go ahead and reward your furry friend with a big bag of treats today and let him know how precious he is with a big hug. (Dr Kadambari Venkatraman is a self confessed cynophiliac. She shares her home with two dogs and a number of other transient boarders she fosters. She has a Masters in Veterinary Surgery and Radiology and currently works with Animal Care Clinic in Hyderabad as a Consultant Veterinary Surgeon). http://www.dogsandpupsmagazine.com/wp-content/uploads/2015/03/Untitled-41.jpg 167 256 Dogs and pups Magazine http://www.dogsandpupsmagazine.com/wp-content/uploads/2017/05/1254nal.jpg Dogs and pups Magazine2015-03-21 12:28:582015-03-21 12:28:58Your Dog, your health booster!